Amazon’s hardware business has been booming ever since the company gave up on smartphones and dove head-first into smart speakers and streaming media devices. These new categories have been an enormous boost for Amazon — in fact, they’ve become the company’s most successful endeavors. The Echo Dot smart speaker and the Fire TV Stick are Amazon’s two best-selling gadgets, and they’re currently discounted. Buy them bundled on Amazon and you’ll save $20, making the price of the bundle just $69.98 instead of $90. Grab them while you can! 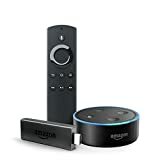 Pair the included Fire TV Stick and Echo Dot and get hands-free voice control of your Fire TV with Alexa. Find, play, and control movies and TV shows from Netflix, Prime Video, Hulu, SHOWTIME, NBC, and more using just your voice.